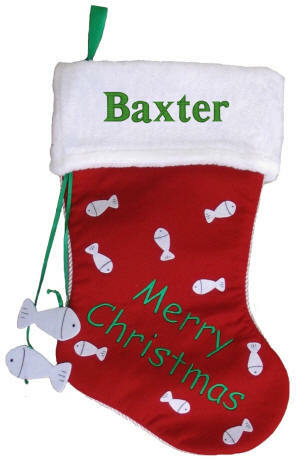 This cat Christmas stocking is crafted from red felt with white fur top and appliques of fish. Embroidery reads "Merry Christmas" in a Kelly green thread. The Edge of the Christmas stocking is in white braiding. Front of stocking is lined, back is felt. This cat Christmas stocking measures 19 in. diagonally and is 10 in. wide. White felt fish hang from the side on a green ribbon.